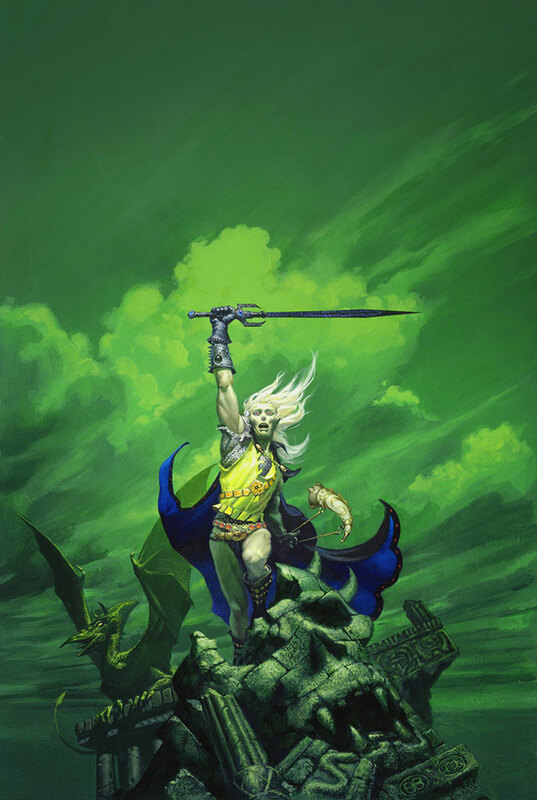 This is probably Michael Whelan's most famous painting of Michael Moorcock's legendary anti-hero Elric of Melnibone. Whenever he sees it he can't help smiling, because he remembers Donald Wollheim saying that "green covers never sell books." Yet Don took the chance and used it for the cover and it sold great. The epic tale of Elric of Melniboné, albino prince of ruins, moves to its awesome conclusion - with the whole of the natural and supernatural world in mighty conflict - the final conflict, Armageddon. Elric holds the key to the future: the new age which must follow the destruction. To turn that key he must sacrifice all that he loves and risk his very soul.